A pedal powered trip of a lifetime! 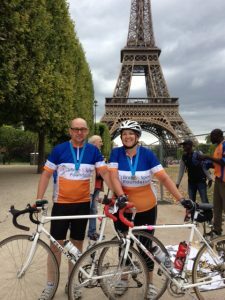 The London to Paris bike ride takes you through beautiful English villages and into the stunning countryside of rural France. You'll pass historical landmarks and famous battlefields from World War I until you reach Paris, undoubtedly one of the most magical places on earth. The sense of achievement you'll experience will be one you'll cherish forever - an unforgettable experience awaits you. Email our team at events@brainandspine.org.uk to register for the July 2019 race! Our challenge begins bright and early from Londond, we head south to the coast and take the evening ferry over to Calais. 95 miles (approximately). We will head east out of Calais and into the stunning countryside of northern France until we reach the industrial town of Henin-Beaumont where we spend the night. 85 miles (approximately). Our route today takes us through Saint-Quentin and then on to our hotels for the night in Compiegne, home to the beautiful Chateau de Compiegne built originally for Louis XV and restored by Napoleon. 100 miles (approximately). Our final day of cycling and the big push to Paris, our final destination. 70 miles (approximately). The day is yours to soak up the Parisian way of life and explore the city. Eurostar home, arriving at St Pancras.